People often use the terms disaster recovery and business continuity planning interchangeably, but while these two terms are similar, they describe two different approaches businesses take to bounce back in the event of a disaster. Below, we dig a little deeper into the unique components of each plan and how they differ, but first, let’s talk about why they’re essential in the first place. Businesses face a wide variety of threats that can impede their ability to function. According to Secure-24, these could result from natural disasters like fires, floods, tornados, earthquakes or hurricanes. There are also many man-made threats like industrial sabotage, workplace violence or cyberattacks. Without both a business continuity plan and a disaster recovery plan in place, businesses face dire consequences. The stakes are especially high for small businesses. According to FEMA (Federal Emergency Management Agency), 90% of smaller companies fail within one year after a disaster if they’re unable to resume operations within 5 days. Without detailed plans for preparing for such a disaster, businesses are setting themselves up for failure. By focusing on both business continuity and disaster recovery planning, you can ensure your business can withstand these challenges. In reality, both plans are referred to generally when describing a business’s disaster preparedness, whether for prevention or response or both. 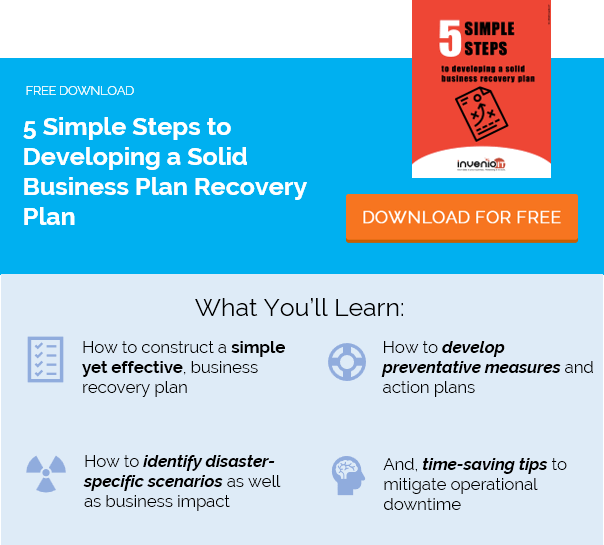 But also, it’s important to remember that a comprehensive business continuity plan will actually have a disaster recovery plan built into it. Your BCP is a master document that should encompass all aspects of a company’s disaster prevention, mitigation and response, including the recovery protocols (whether tech-focused or not). You cannot have an effective business continuity plan without addressing how the business will recover from different kinds of disasters. Confused? Don’t be. Let’s take a closer look at each plan. A business continuity plan is a broad plan to keep a business up and running in the event of a disaster. It focuses on the business as a whole, but drills down to very specific scenarios that create risks for operations. With business continuity planning, generally speaking, you’re focusing on the critical operations that the business needs to get up and running again after a disruption in order to conduct regular business. If the plan is followed correctly, businesses should be able to continue to provide services to customers during or immediately after a disaster with minimal disruption. The plan also focuses on the needs of business partners and vendors. A business continuity plan is a written document that lists the business’s essential functions. According to TechTarget, these are things like a list of critical supplies, employee contact information, a list of crucial business functions or copies of important records. Basically, the business continuity plan includes all the necessary information to get the business up and running as soon as possible after a disruptive event. But even that is only one small component of a BCP, as we address below. A disaster recovery plan can be considered a more focused, specific part of a business continuity plan. Depending on who you talk to, a disaster recovery plan is sometimes narrowly focused on a business’s data and information systems. According to Data Center Knowledge, for example, a disaster recovery plan is designed to save “data with the sole purpose of being able to recover it in the event of a disaster.” For this reason, disaster recovery planning is usually focused on the needs of the IT department. Depending on the type of disaster, the plan could involve everything from recovering a small data set to the loss of an entire datacenter. Since most businesses are increasingly reliant on information technology, the disaster recovery plan is an important part of business continuity planning. A disaster recovery plan can also refer to protocols that are outside the realm of IT. For example, the plan could include steps for recovery personnel to seek a secondary business location to resume critical operations. Or, it could include guidance for how to restore communication between emergency staff if primary lines of communication are unavailable. In other words, disaster recovery planning does not always have to be strictly IT-focused, though it often is. If your IT personnel are creating an IT-focused disaster recovery plan, just be sure that all non-IT recovery protocols are included within the larger BCP documentation. Prevention: Steps and systems to prevent certain disasters from occurring in the first place. Mitigation: Processes to limit the impact of disasters when they occur. Recovery: Protocols for restoring operations as quickly as possible to limit downtime or other adverse consequences. These are broad categories that need to be defined individually for each possible disaster scenario. To do so, you need to gain a better understanding of the unique risks that pose a threat to your organization and how those events will impact the business in terms of downtime, costs, reputation damage, and so on. Contact information: Contact details for those who developed the BCP, and/or key recovery personnel within each department. Plan objectives: The overall objective for the plan, i.e. its purpose and overall goal – what it aims to accomplish, why it’s critical, what areas it focuses on, etc. Risk assessment: A thorough assessment of disaster scenarios that could disrupt operations, prioritized by likelihood and/or severity of impact. Impact analysis: Specific outcomes for each disaster scenario in terms of how much they negatively impact the business, i.e. the costs for idle workers, recovery costs, hardware damage and repair, etc. Prevention: Steps and systems for preventing each of those disasters, such as the implementation of antimalware systems to prevent certain cyberattacks. Response: How the business should respond to each disaster to minimize impact and initiate a rapid recovery, such as restoring backups after a data loss. Contingencies: A list of secondary backup assets and/or protocols, such as a backup office location, backup equipment and so on. Communication: Protocols for staying in communication with recovery personnel and/or all personnel at large, such as a text alert system, company extranet, calling trees, etc. A disaster recovery plan is essentially the “Response” component of your business continuity plan. It encompasses all the procedures, technologies and objectives necessary for completing a quick recovery after a disaster. This recovery could pertain to lost data, damaged hardware, network outages, application failure or virtually any other point of failure across your operations. Recovery technologies: All systems currently implemented (or those that should be) that support the recovery process. An example would be a data backup and disaster recovery system that enables you to recover critical files that have gone missing or large datasets that have been infected with ransomware. Recovery Time Objective (RTO): Your RTO is a desired timeframe for completing recovery before things take a turn for the worse. It can be applied to the business as a whole or individual layers of IT, like data recovery. For example, an RTO of 30 minutes would mean that all data should be recovered or restored within 30 minutes after a loss is discovered. Recovery protocols: Who does what in a disaster situation? Your DRP should clearly define the roles of your recovery personnel, so that there is no confusion and not a minute wasted when disaster strikes. In the case of a data recovery, who oversees it? How, exactly, do they do it? Who do they communicate with, and how are updates communicated with other personnel? All of this should be spelled out to ensure that recovery teams know what to do and can refer back to this guidance when needed. Vendors, supplies & other third parties: These could be IT providers, telecommunications companies or other third parties that may be needed to support the recovery process. For example, in case of an Internet outage, your DRP should identify your Internet provider’s emergency contact information (ideally a specific point of contact) to ensure a faster resolution. Recovery testing: Periodic tests and mock disaster scenarios to confirm your recovery systems work as they should. One example could be a test data recovery to confirm that backups are available and can be restored without integrity issues. Like your BCP, your disaster recovery plan should also be updated periodically to ensure all the information is still accurate. Also, remember that the information in your DRP should be dictated in part by a thorough business analysis, like the risk assessments and impact analyses from your overall continuity planning. It is indeed important to understand the differences between a business continuity plan and a disaster recovery plan, but perhaps even more important is understanding how these two documents hinge on each other and play a connected role in maintaining continuity. One of the best strategies in disaster recovery planning is to keep all of your data backed up on a server at a secondary site. This way, if a disaster occurs at the primary site, a backup of all vital data is available. A good disaster recovery plan will dictate how you manage and access data from the secondary site as quickly as possible. For example, in the case of hybrid-cloud backup systems like the Datto SIRIS, you have several recovery options available to you. If a disaster occurs at the primary site, you can restore data from the cloud or boot the entire backup as a virtual machine. The virtualization method allows for instant access to data and applications while a full recovery is in process. Ultimately, the reliability of your disaster recovery plan is dependent on everything you’ve included in the plan: all the infrastructure, processes, planning and testing. Get more information on today’s best solutions for business continuity, data backup and disaster recovery. Request a free demo or contact our specialists at Invenio IT by calling (646) 395-1170 or by emailing [email protected]. What Is IT Disaster Recovery Management, Exactly?